Private collection (sale, London, Christie's, 25 June 1968, no.77); to Lumley; (Hans M. Calmann [1899-1982], London); purchased by NGA. NGA Recent Acquisitions 1974, no. 25 (as Martyrdom of Saint Alexander of Bergamo). 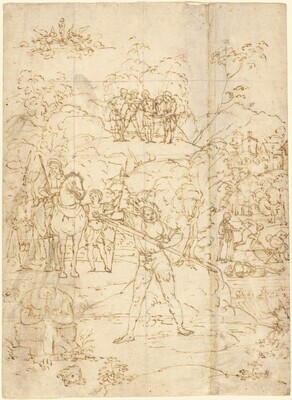 Venetian Drawings from American Collections, International Exhibitions Foundation, circulated to National Gallery of Art, Washington, and tour, 1974-1975, no. 12 (Terisio Pignatti). NGA Master Drawings 1978, p. 40-41. The Poetry of Light - La poesia della luce: Venetian Drawings from the National Gallery of Art, Museo Correr, Venice, Venice, 2014 - 2015, no. 15. Pignatti, Terisio. Venetian Drawings from American Collections. Washingon, 1974: 11-12. Recent Acquistiions and Promised Gifts: Sculpture, Drawings, Prints. Exh. cat. National Gallery of Art, Washington, 1974: 64-65. Sutton, Denis. "Sunlight and Movement, Splendours of Venetian Draughtsmanship," Apollo (October 1974): 276-277, fig. 5. Rearick, William R. "Lorenzo Lotto: The Drawings, 1500-1525." In Lorenzo Lotto, Atti del Convegno Internazionale di Studi per il V Centenario della Nascita. Pietro Zampetti and Vittorio Sgarbi, eds. Treviso, 1980: 30-31, 36, note 44, fig. 12. Walker, John. National Gallery of Art, Washington. Rev. ed. New York, 1984: 664, no. 1051, color repro. Rearick, William R. Il disegno veneziano del Cinquecento. Milan, 2001: 87.